In spite of my complete lack of real world experience with the Southern lifestyle (so much so that our hosts for Thanksgiving wanted to make sure I would eat greens), I am falling in love with the recipes from The Southern Living Big Book of Christmas, courtesy of my local library. My first recipe was the cranberry-maple sauce that was a 5 minute Thanksgiving breeze. The next couple cookies that I post up here are all from the same book. I'm impressed. I'm always picking up books from the library. One of the many reasons I love the library - I can continually try new things...and not have to buy and store tons of cookbooks. So, on to the bonbons (their name for it). 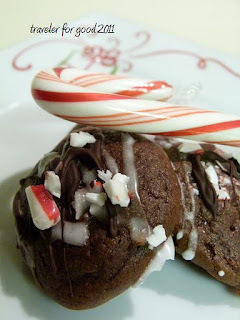 I could probably call them something like Chewy Chocolate Peppermint Cookies, still apt, but not as catchy, unless we just referred to them as the CCPC. On Dasher, On Dancer, let's get these cookies in the oven! Combine the first three ingredients in a small saucepan, cook over low heat until chocolate melts and mixture is smooth. Scrape into large bowl. Stir in candy canes and sugar. Let cool for 30 minutes. Add eggs to mixture one at a time. Add extracts. Combine flour, baking powder and salt. Add to chocolate mix. Stir in chocolate chips. Cover and chill dough 2 hours or until firm. Roll dough into balls, place on parchment lined (or silicone baking mat lined, in my case) baking sheet. Bake at 325 for 12 to 13 minutes. Colorado baking time: 13 minutes worked out just fine. The cookies didn't look "puffed and cracked on top" like the original recipe said, they were pretty smooth, but since the end result was delicious, I didn't mind. Right after you take the cookies out of the over, lightly press some of the crushed candy cane garnish into the top of the cookie. Let cookies cool a few minute on the sheet before transferring to the counter/rack to cool. To make them look even prettier on top, mix the milk and powdered sugar together to drizzle over the cookies. Follow that drizzle with drizzle from melted chocolate chips and then sprinkle a little more candy cane on top. Share with friends, quickly, before you eat them all. These definitely put you into the spirit of the holidays. I love chocolate and mint-too bad it seems to be a forgotten combo for the whole rest of the year! I would gladly devour a few of these gems anytime. Thanks for sharing! Hi Tina! I love chocolate and peppermint. I recently learned that Starbucks keeps peppermint syrup all year, even if they don't promote it. Think of it - a nice iced peppermint drink in August. Happy Holidays!